t Here are five of the seven cards I made with supplies from the August Paper Pumpkin 2016 kit. While the intended cards are great, I want to offer you some alternatives. The stamp set that comes with the kit are just awesome this month. Great flower back ground stamps and greetings. I used the colors that the kit was made up of and added some additional paper such as the rust color, orange and light blue. I also added some copper thread on the third card and mint macaroon and cajun craze ink on some since these colors were in the kit. That’s it for the additional products. If your a paper pumpkin subscriber from me, I will send you a picture of selective alternatives and supplies to make the additional cards. Now is a great time for subscriber to join. Buy the September kit by September 10th and receive the next month FREE. That’s $40 worth of products for only $20. The kits include everything you need to make the projects except scissors. That includes a stamp set, ink, adhesives, paper and embellishments. It’s a great little treat to receive each month or give it as a gift for someone. See the next blog for more on this deal. Just contact me either through a comment or by email darstz@hotmail.com, to sign up. Here is a card made with materials from the new Holiday Catalog which goes live on September 1st. The stamp set used is the Cookie Cutter set which comes with a matching punch. DSP from the new catalog Candy Cane Lane. Trinket and twine also from the catalog. Paper is Early Espresso and Real Red. This stamp set also has a bear, eskimo, santa, and moose/reindeer head that can all be punched out with the matching punch. When you buy the bundle, you save 10%. There is also a halloween stamp set called Cookie Cutter Halloween that has four figures you can also punch out with this punch. Let me know if you would like a copy of the catalog by leaving a comment or emailing me at darstz@hotmail.com. 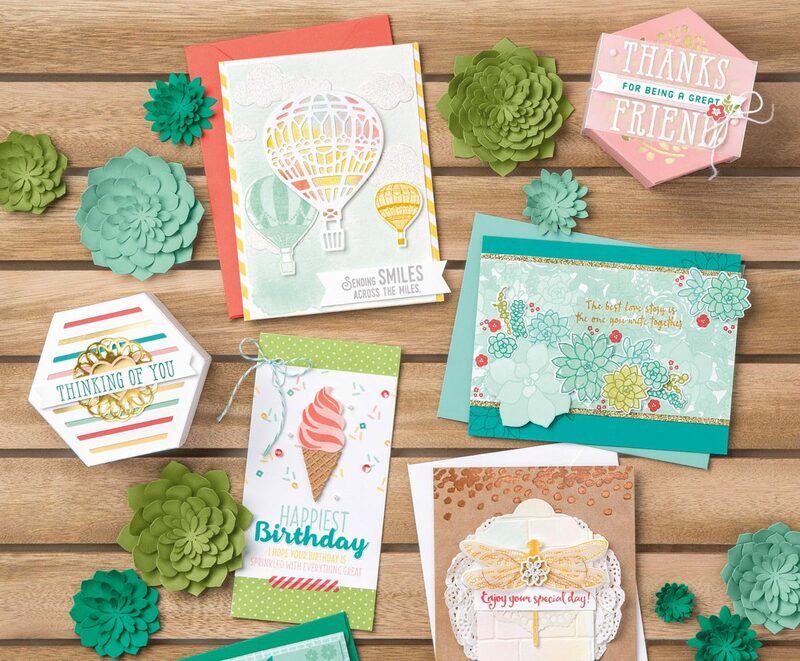 To shop for current products please go to my online store at http://darleneseitz.stampinup.net. Is it too early to say Happy Holidays! Having some more fun playing with some of the items in this year’s catalog. The first one is using the embossing folder called Floral Affection and watercoloring the flowers and the leaves. Also using one of the new in-colors (sweet sugarplum) paper and dsp. Actually this embossing folder comes with another in the same package and costs only $9. This is an inexpensive way to make a great card. The other embossing folder is a flower that can also be watercolored. The second card is using the new Vertical Greetings stamp set and is a must for anyone who does not have a vertical greetings stamp set. The tree can also be dressed up with some red to make a christmas card (red bow, enamel dots, red paper, red ribbon and of course a christmas greeting). The third card is using the Floral Boutique DSP with some botanical die cut flowers (botanical builder framelits). All these products can be found on my on-line store at http://darleneseitz.stampinup.net. Have a very crafty day. Stampin Up has released a picture of the August paper pumpkin stamp set and that the project are cards. They usually keep it quite a surprise until you receive your kits. This is a very versatile stamp set with 4 greetings included. This is a $16.00 value on it’s own and for $20 you get the whole kit which includes all the paper, die cuts, ribbon and other embellishments, ink, adhesive and an acrylic block with the first order. It also includes shipping. Paper pumpkin is a craft kit that comes out each month that can be a subscription or ordered month to month and can be any kind of paper craft. Many who order also see what other alternative projects, like cards, with the supplies. You tube and pinterest has many alternative projects for you to make as well. If you join with me, I will send you alternative card kits with any supplies that do not come with the kits. See other blog posts for some of these alternative projects. To order, go to http://paperpumpkin.com and use demonstrator code 2096764. Also, my website store is http://darleneseitz.stampinup.net to order other products.